Here for the giveaway? Our commenting system went down earlier this week, and - even though they are not showing below - all entries from prior to 04/09 have been saved in our system. Rest assured, that your entries have been counted. I've been using my iPhone for over 3 years, and recently just took the plunge from the first model to the 3GS. I tend to be a slow adopter when I really love something, and I'm reluctant to switch brands for no reason. The past month, however, I've been testing the Nokia Lumia 710, which runs on the Windows 7.5 Mango Operating system. This has been a huge adjustment for me, but one which I'm excited to tell you about. Now, on to our experience. This phone is seamless to set up. Thanks to the SmartStart program, I was given the option to get a free one-on-one usage tutorial with an expert to help me set up the phone exactly how I like. (I honestly didn't need this, because the phone is that easy to figure out -- even with no Windows phone experience.) I was up and running in minutes, and as I opened each application for the first time, I was prompted to set up my accounts in a step-by-step walk-through on the screen of the the phone. The phone sound quality was excellent, the screen very vibrant. I used it to watch Netflix movies and other online streaming programming while waiting for my plane. It loaded quickly, and the video wasn't jerky or fuzzy. I also found that many of the apps I use on my iPhone were available in the Windows store (Angry Birds, for example), as well as a host of new programs that I wasn't aware of. Purchasing and downloading new apps was simple, and if I lost connection, the apps download resumed on their own in the background when I was in range again. The most impressive feature of this phone is the social and connectivity aspect. Calendar can be easily integrated into your social apps, like Facebook. This means that if you accept an event invite on Facebook, it automatically shows up on your calendar. (Have 3,000 Facebook friends and DON'T want all of their birthdays cluttering up your calendar? That's OK. You can turn this feature "off", or adjust it as you wish.) I also really liked the way the phone categorized programs to revolve around how you would use it; the social app, for example, lets you group people in your contacts lists, email accounts, and social apps into customized categories ("work friends", for example), then monitor just the activity from that group when you want. You can also "pin" just about anything or anyone to your start page to see activity from that person with one swipe, allowing you to view all of your hubby's LinkedIn, Twitter, and Facebook updates with no effort at all! My favorite (and most used) features of the phone were those involving email. When you have several accounts (like many of us do), this phone makes it super easy to access any account at any time. The ability to view the email with the phone held vertically or horizontally was nice, and I LOVED how quickly I could scan through hundreds of emails, previewing, moving, or deleting with just a few swipes. This was the most useful function of the phone for me, and I would dare to say that I would almost rather handle my cluttered inbox from the phone rather than my new desktop PC! If you are looking for a phone that oozes genius, looks sharp, and can be used from the get-go without a manual, this phone meets about 98% of my expectations. I would imagine that it would meet all of them, if you didn't have a slight nostalgia for Apple products. Those of you who have been using Android phones or haven't had the joy of owning a smart phone before, however, will have no prejudices; this phone can do everything you want with sophistication and style! 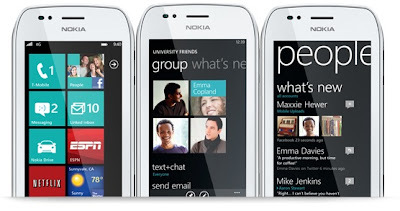 Learn more about the Nokia Lumia 710 from your T-Mobile dealer or the official website. 2. Retweet this post using the following text: "Check out @LKnerl's review of the Nokia Lumia 710 and enter to win a phone from @NokiaUS http://bit.ly/H2eCUT"
You have until April 12th at 11:59 pm CST to get your entries in. You may enter every day, and we will pick one winner at random from all eligible entries. (You must tweet daily for daily entries. For the comment portion, please answer the question for the first comment entry. Each daily entry after that can be "enter me." ) This giveaway is open to U.S. residents ages 18+. See our full rules here. *Sample model was received to review. Opinions are 100% my own. I love the fact that it makes navigation friendlier and that I can check my e-mails quicker and more efficiently. Thank you for this opportunity. 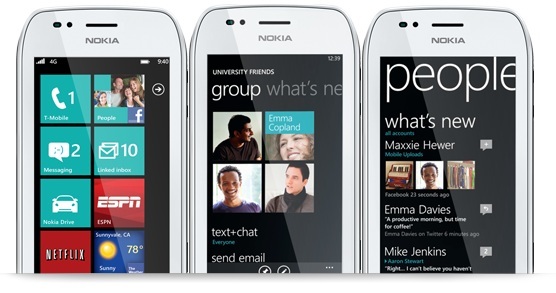 I love that this is a windows based phone. Have had much better luck and its so much easier to navigate a windows based system phone. I can call my posse! I like the organization tools that this phone provides and that is a Windows phone. IT would simplify my life becasue it can do just about anything a computer can do! I am always 2 cities away caring for my dad throughout the week and I would love to have this phone. I could get so much done on my down time while he is in therapy, and I could keep him busy with games and fun things to look at :) Thank you SO MUCH for this chance! I love the fact that I would be able to do internet on it. on my phone I can really only do phone calls and texting. I can talk with long lost folks! It will make my life simpler by keeping it more organized, thanks for the chance! This phone could simplify my life because I don't need to read the manual to operate it! my dad is getting up in age and still has an ancient old flip phone being held together by duct tape. i worry about him so having this awesome new phone (he is tech savvy) would 1. keep him entertain 2. keep him safe and 3. keep him in contact with me! The Nokia Lumia 710 would simplify my life by giving me options on fun things to do while I am waiting here, there and everywhere. I love you can check your email. I travel a lot because I go home to two different cities. This will make my travelling more comfortable and entertaining because of it's on-the-go features - I can check my mail, Facebook, and use different apps! It could simplify my life by allowing me to get business e-mails all day from clients in my car. This phone would simplify my life by making it easier to stay in touch with my family. I can speak with the out of towners. This phone would make my life easier because it is like a little computer. I would be able to check my email anytime, contact friends on facebook, and surf the web. I love that it's easy to navigate & easy to use! It would be a huge step up from my old razer phone that is a hand me down from my oldest daughter. I would love to have a phone with a camera to take impromptu pictures. I could finally have a phone that would take pictures of my babies! It would simplify my life by just having a real phone! I could text with the rest of my family and not have to make all the phone calls. Currently I just have an old pay as you go phone. Would love one like this to keep up with all the family! This phone would make a dramatic difference in my life--the phone I have now is an older model that makes and receives phone calls. This one does so much more. I like how user friendly it seems. Oh, and I love great sound quality too. I have the oldest and most outdated phone that really has no features to even mention so this would make my life easier by allowing me access to my mail which I cannot even do on my phone now! would love to win, i have a small business and this phone would help me keep up with stuff on the go! This phone would simplify my life because I have an old phone without internet and need a serious upgrade! I don currently have a cell phone, so it would definitely simplify my life just having one in general. With 4 kids this would simplify my life a ton! I sure would like to have a phone like this!! I HAVE A VERY BASIC PHONE. I NEED A NEW PHONE LIKE THIS. I'd be able to check my e-mail more often which is always a plus. It would make access to Email so much easier. love the social connectivity feature you described,my current HTC model is a mess with this! This phone could keep me organized! I am always forgetting appointments and grocery lists. It would be so nice to have it all in the palm of my hand!! My phone is an old style blackberry pearl, it has nothing in terms of keeping me organized. I would love this and it would bring me into the tech world one text at a time!! I would like to have a cell phone. I can call my cousins! would be great for keeping track of everything i need too! My phone is not internet ready, would love to have a phone that has internet, really like to check my emails. THis phone would simplify my life because then my daughter would stop harassing me to use my iPod or to buy her a new phone...oh man, do I need this. Her phone is old and outdated and "lame." So just for the sake of not having to hear her whine about it, this would simplify my life. My phone's screen cracked into 20+ pieces so this would be an awesome blessing! I'd love a phone which could simplify my email! My current phone only makes calls.